This is a transcription of a note left by Mary Scott to their daughter Marion along with the urn shown in the photos. ‘This Tea Urn belonged to Miss Archer who died in 1926 and is buried just west of the steeple at Lt. Burstead Church, Billericay. She lived on ‘The Elms’, opposite the Village Pond close to the War Memorial in Lt. Burstead Village. My Parents were married in 1925 and were the second to last couple to be given a pair of Blankets by Miss Archer as a wedding present. 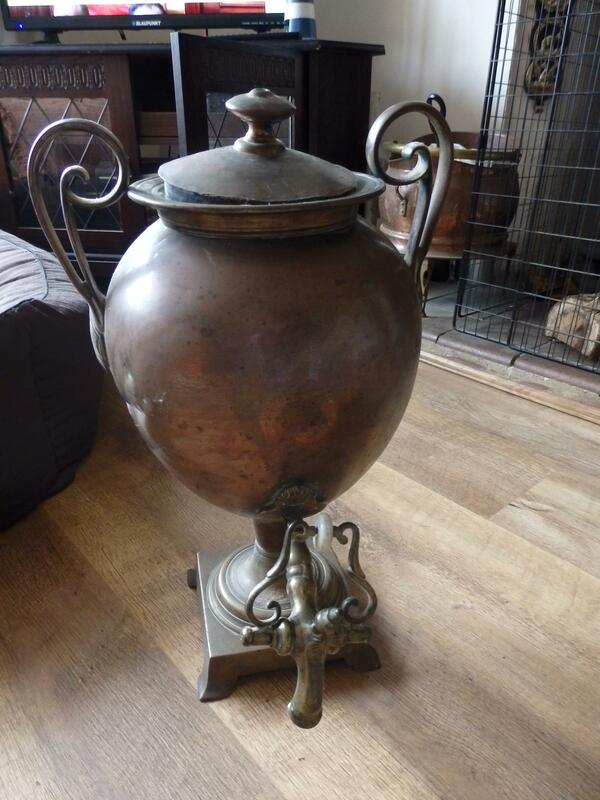 When she died, my Father, Tom Carpenter, was the local Blacksmith and Farrier who had an amount of items of her property which included the Tea Urn, it stood in his shed for a good forty years going green without being polished. In about 1965 Lionel asked my Mother could he polish it and it took several weeks to get it looking good again, now we would like to give it to you Marion. Miss Archer gave land in Billericay just west of the in Billericay by the Rising Sun Public House in Laindon Road for a Church, Rectory and Hall to be built. The Rectory and Hall were built in about 1926. The Hall was demolished in 1991 to make way for The Emanual Church, the Church people saying they would rebuild the Archer Hall in a smaller form, this has not happened. Note: Emmanuel Church in Laindon Road which was built on the site of the Archer Hall does today have a hall and serveral small rooms attached. 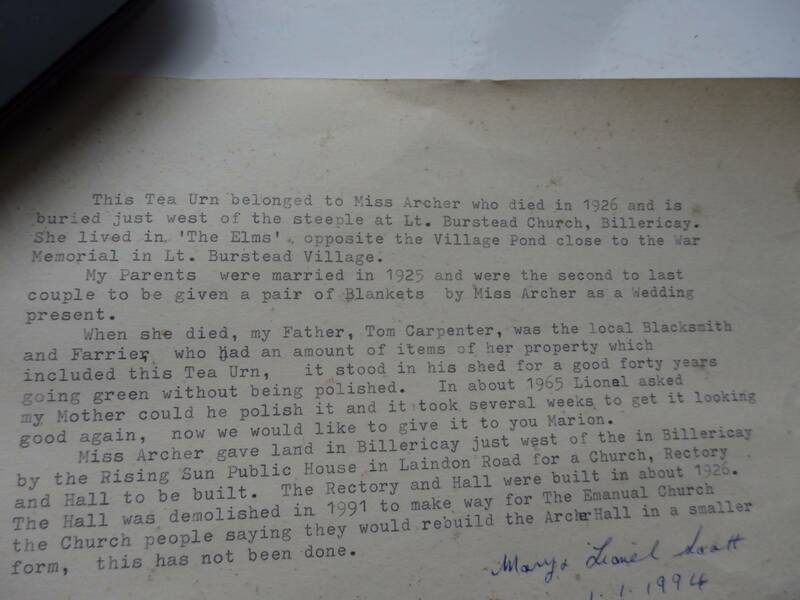 I am Mary and Lionel Scott’s daughter and the tea urn is in my possession, but when I am no longer here it will be donated to The Cater Museum.